Our waterways and landscape provide a stunning backdrop for diverse experiences, historical landmarks and state-of-the-art activity centres. The Fermanagh Lakelands are certainly worth exploring. sonaghan, ferox and gillaroo can also be found in these diverse waters. Europe, with bream, roach and hybrids in abundance as well as perch and tench. trout are found throughout the system. The Lower Lough is a large expanse of water, over 15 miles long with numerous islands and bays. These provide vast areas of shallow water and rocky shores making for ideal fishing grounds. 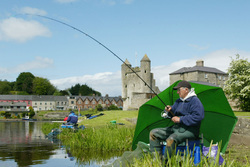 Although a limited number of salmon run the Lough wild brown trout are the quarry and the Lough holds an excellent head of fish. Sitting on the western end of Co. Fermanagh this is one of Ireland’s most famous Loughs. It is home to three distinct species of trout – the magic sonaghan, the gillaroo and the ferox – as well as enjoying a run of spring salmon and grilse.